It was hot. The supermarket was crowded with tired, cranky people (me) doing their shopping after a long work day. The line wasn’t unreasonable given the time of day, but it couldn’t move fast enough for me. TWO people in front of me. ONE person in front of me. THERE. I reached into my basket to put my purchases on the conveyor belt and a swarthy grandma slid her cart in front of mine, unloaded, and began pulling her coupons and cash from her bra. I gaped like a fish out of water. I debated the merits of telling off someone who was a whole half-century older than me. She looked tough; she might be able to take me. And then I looked overhead. Oh how could I have been so blind, so stupid? Damnitall, I had picked the Priority Service line. What is the Priority Service line? It is a Brazilian institution whereby the defenseless of society are given preferential treatment and saved some of the indignities of Brazilian bureaucracy. In theory it is admirable, even necessary. The elders aren’t prepared to deal with the immense number of forms or steps or even the simplicity of pulling a number to be waited upon. Because lines in Brazil can have average wait-times of 45+ minutes, it’s also logical that the infirm, pregnant women, and people carrying small babies get to skip ahead to GO. Culturally, all these categories also have a certain amount of respect attached to them. 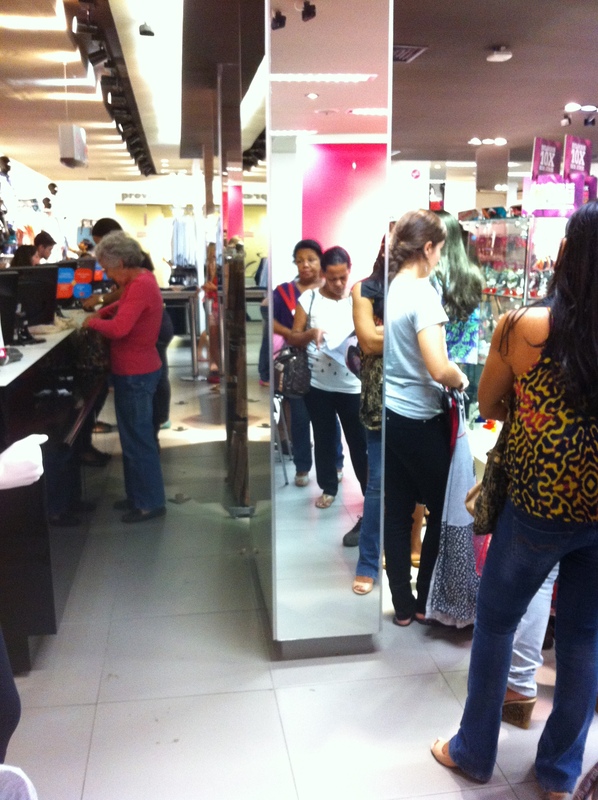 Americans open doors for people, Brazilians give them a head start in the line. When my mom visited, we capitalized on her grey hair to move to the front of a 45-minute line at the department store. Yes, yes, we did. Yes, we’re both able-bodied. And I’m not ashamed, not one bit. Everyone’s got a love-hate relationship with the Priority Service line. When done well it speeds things up; a confused granddad can tie up a line for ages. It’s better that he get devoted attention from a staff person blessed with the requisite amount of patience and loud voice. No one wants to see a young mother wait for hours with a cranky kid (or be stuck in line right behind them). Likewise we all have stories of when it was mismanaged. Anyone who has waited in one of those lines knows the unyielding, red rage that sweeps you as you finally get to the front of the line and then one, then another, then another prioritized person steps in front of you to be served. If you’re particularly unlucky it can double your wait time. And they’re empowered, those senior citizens, yes they are. There’s usually no “excuse me” or “may I?” They just beeline their way to the front and step in. Now that I’m pregnant and an obvious member of a protected category I see it a little differently. Thankfully my pregnancy has been pretty symptomless, so I try not to abuse my privilege. Much. It’s awful nice to know that I can get in and out of the bank in less than half an hour no matter what time of day it is. I was working in the market one Saturday and she came up to me and rubbed my belly. “How many months are you?” “Five.” “Oh! I’m at two months myself!” “Congrats!” Did I know her? Not at all. Maybe through friends of friends. Maybe she works at one of the stores where I shop. In any case, she was very happy to be pregnant and was telling the world. Strange behaviour? Not really. She’s got seven more months worth of Priority treatment to look forward to. Now I still find people accommodating if I show up to pay bills at the Loterica with the 3 kids… 😉 (I know I shouldn’t abuse, but sometimes my patience has its limits). Oh.MY.GOD. What I would have given to be able to skip the line at the place where you get your CPF number! Due to budget cuts our local office had receiving office hours from 1-2pm on Wednesdays only; you can imagine what the line looked like.